The study assessed popular insurance agents located at various distances from the city center. Starting with a radius of 6 miles around Gallatin, Gavop found that three of the most reputed agencies collaborate with Travelers. They are Jenkins & James Insurance, Abba Insurance, and Northland Independent Group. Of them, Jenkins is located closest to the city center at a distance of a mere 1.1 miles. Farmers is represented by the well-known agent Jason Ayers. Liberty Mutual is represented by the popular agency Krueger & James Insurance, located in the same distance range. Between 6 and 12 miles of Gallatin, State Farm is represented by 3 more popular agents: Jeff Zigman, Liam Porter, and Debbie Baker. Two reputed agents—Brady Crawford and John Hardly—operate within a distance of 13-20 miles of the Gallatin city center. They are also associated with State Farm insurance group. Among all the agents mentioned above, John Hardy is located the furthest, at a distance of 19 miles, from the city center. 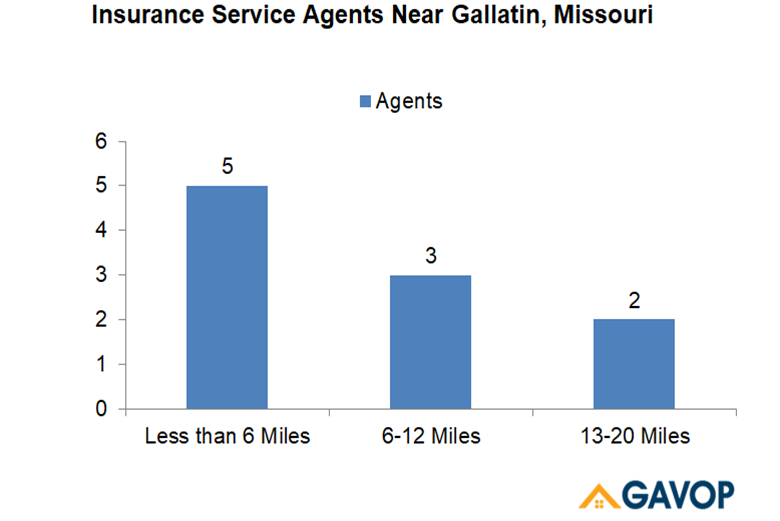 In conclusion, the study found that within a 20-mile radius of Gallatin, State Farm is represented by 5 popular agents, Travelers by 3, Liberty Mutual by 1, and Farmers by 1 reputed home insurance agent. The following chart shows this information graphically. The table below lists the most popular home insurance agents in Gallatin, Missouri, and their distance from the city center.